She was perhaps the dog I’ve lived with who had the best disposition. 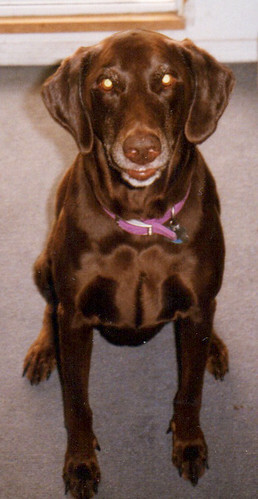 My ex got a dog for her kids before I moved in; Fusge came from the pound, a chocolate lab / doberman mix. I think the kids tacked on the “MC” in front of her intended name (for her obvious colors). Thanks to the bits of my Mom’s annual calendar that are now my Google calendar, I get a reminder that she passed away this day in 2001. I remember taking Fudge on runs (me on a bicycle) so she would not be so energetic for a kids sleepover. I remember camping in the woods up here not too far from where I live now. I remember her being a good companion to Dominoe when I moved in. I remember her once eating a whole bowl of raw shrimp sitting in the sink, and a few times eating a crater out of a tray of brownies. 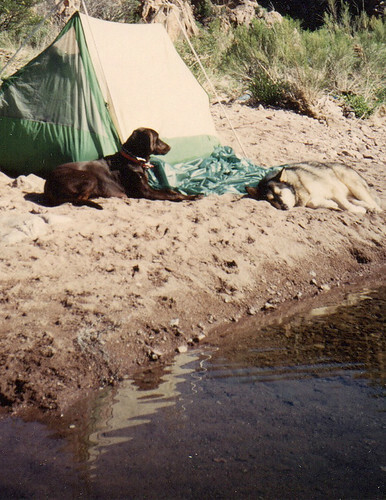 I remember a backpack trip in the Superstition Wilderness with my friend Uwe, who brought his dog, Husky. That poor dog ended up with blisters on his pad, and Uwe carried him out the last few miles. Fudge? She walked out solidly. I remember her just always happy to see you. I remember her muzzle growing grey with age. I remember the summer of 2001, when we noticed she stopped eating. I remember the vet describing the advanced cancer that had engulfed her stomach. I remember that dog not showing one indication of what had to be severe pain. I do not feel like I really remember nearly enough. These memories are shreds, fragments, faded photos. Here’s a raised paw to you, MC Fudge, a Dog among dogs. This is a great example that an excellent blog post can be constructed using the simple, repeated “I Remember…” writing prompt and that, as you say the simplest and most evocative form of digital storytelling is still text + photos. Oh. And a dog. Thanks Sandy- the funny thing is that the idea for it only emerged as I was writing- the contrast of what I remembered was really not much, but the feeling– still strong.